If you've ever wondered how the obscenely rich squander their wealth, here's your answer. 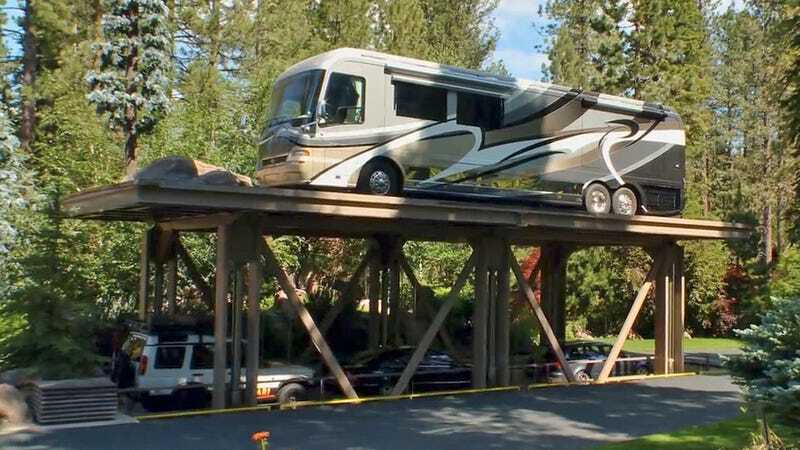 Tom Gonzalez made a small fortune when he sold his software company, so he purchased an elaborate estate in Lake Tahoe, Nevada, which includes one of the most over-the-top and drool-worthy garages we've ever seen. The top floor houses an impressive collection of motorcycles, but it's the garage's basement that will blow you away. Tom's gleaming white subterranean oasis is large enough to hold 40 vehicles, or park 9 bus-sized RVs. And how does he get his rides down there? With a massive hydraulic lift like is used on an aircraft carrier. At 60 feet long and 12 feet wide it's capable of lifting over a quarter of a million pounds, requires 800 gallons of hydraulic fluid, and uses $25 worth of electricity every time it's raised and lowered.